Kurt and his happy crew played a low key set set last night at the Kings Arms. Adam kindly gave me the set list. Alastair Galbraith opened. I haven’t seen Alistair for many years. He ran through a reflective set. I was impressed by the audience as they gave him a good hearing. 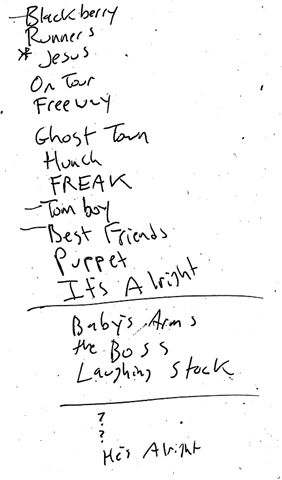 Kurt is obviously a big fan and took notes while Alastair played.